Was last night's Mike Pelfrey start a step in the right direction? He says it was, and so does Terry Collins, and compared with his first two starts, three earned runs (the fewest he's allowed in a start this year) over five and a third innings (the longest he's lasted) does count as something of an improvement. And when he left the game in the sixth, passing along two baserunners to Ryota Igarashi, the Mets still clung to a 4–2 lead. 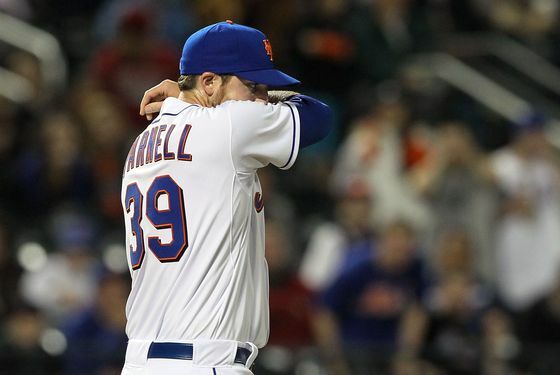 But Igarashi would allow those two runners to score — thereby eliminating Pelfrey's chances of earning his first win of the season — and the worst from the Mets' bullpen was still to come. An inning after a legitimately nice moment for the bullpen — a warm ovation for Jason Isringhausen, who retired both batters he faced to close out the seventh — Bobby Parnell would kill any remaining good vibes by allowing three runs to score: the first on his own throwing error trying to nail a runner at the plate, and the other two on a home run from Troy Tulowitzki, who also made an outstanding jump throw (a couple years ago, we'd have described it as "Jeterian") on a grounder in the hole to nail Daniel Murphy to end the seventh and strand Jose Reyes at third. The Mets would open the eighth with three straight hits and cut the lead to 7–6, but that's as close as they would get. And so despite a sort-of encouraging outing from Pelfrey — again, it was better than the first two, but he still only threw 67 of his 113 pitches for strikes — perhaps he remains a concern, particularly given the expectations entering the season with Johan Santana on the disabled list. But after the bullpen's performance of late, he's hardly this team's only concern.